It's got nothing to do with Java programming whatsoever other than my scheduled coffee consumption for the rest of the day. I made the effort to get up early today to capture a few pictures of this morning's lunar eclipse and the results were not disappointing. 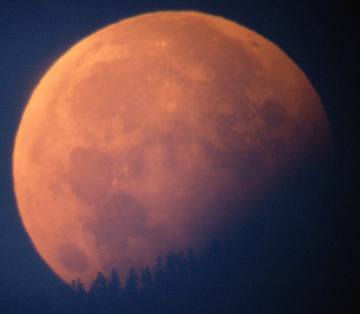 This picture is taken through a 5 inch telescope just as the moon begins to set over the horizon as the day dawns: you can see the approaching silhouettes of the trees on the left and the section of the moon in the earth's shadow in the bottom right. See @BitterCoffey on Twitter for a larger version of this and another picture from the eclipse.